Usain Bolt is the world record holder in the 100m and one of the fastest men ever over 200 metres. He is a son of Jamaica and we are all proud of him as he prepares to start his chase for medals in the 2008 Olympic Games come Friday. 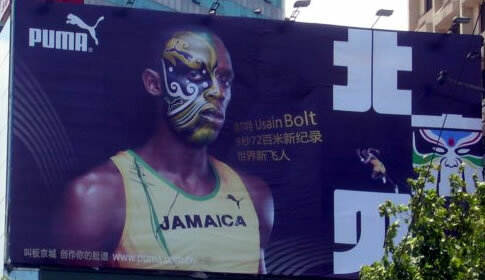 As expected Usain had been a marketting dream and his main sponsor sportwear producer PUMA has been making the most of it plastering Usain’s image throughout Beijing on huge billboards and have many videos of the track star on chasingbolt.com as he documents his experiences at the Olympic Games and his quest for 100m, 200m and 4x100m gold.